Fair deal. Dell bundles a pricewise, attractive 17 inch multimedia laptop with its Inspiron 17R. You get a Sandy Bridge processor from Intel and a midrange graphics card from Nvidia for 700 euros. Is this a deal you can't refuse? To stand out from the mass of multimedia laptops is no longer an easy task for any manufacturer. Dell takes an innovative turn for its newest entertainment sprout and advertises the Inspiron 17R with an exchangeable lid ("SWITCH"). The standardly black outer shell (Diamond Black) is also available in a red and blue alternative (Fire Red & Peacock Blue) for a surcharge. If you like it even more extravagant, you can additionally order special designs with stylish patterns in the accessories department of Dell's own shop. 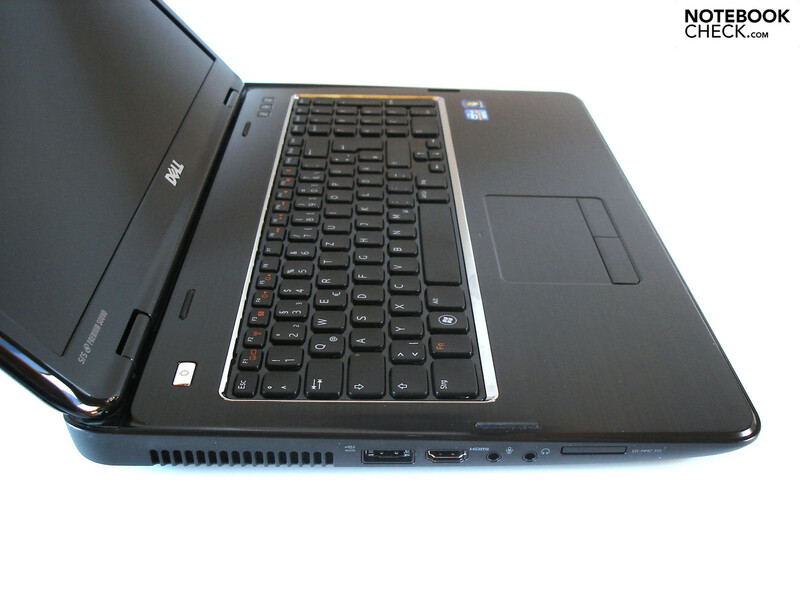 The Inspiron 17R otherwise shows itself conventional in other regards. One of Intel's latest dual cores does its job as the processor, either the Core i3-2310M (2.10 GHz) or the Core i5-2410M (2.3 – 2.9 GHz) depending on the model. The customer doesn't have any major influence on the graphics card. While the cheaper model has to be content with Intel's weak HD Graphics 3000 (incorporated in the CPU), the other three models are equipped with the DirectX 11 capable GeForce GT 525M. The options for RAM and hard disk are also limited. 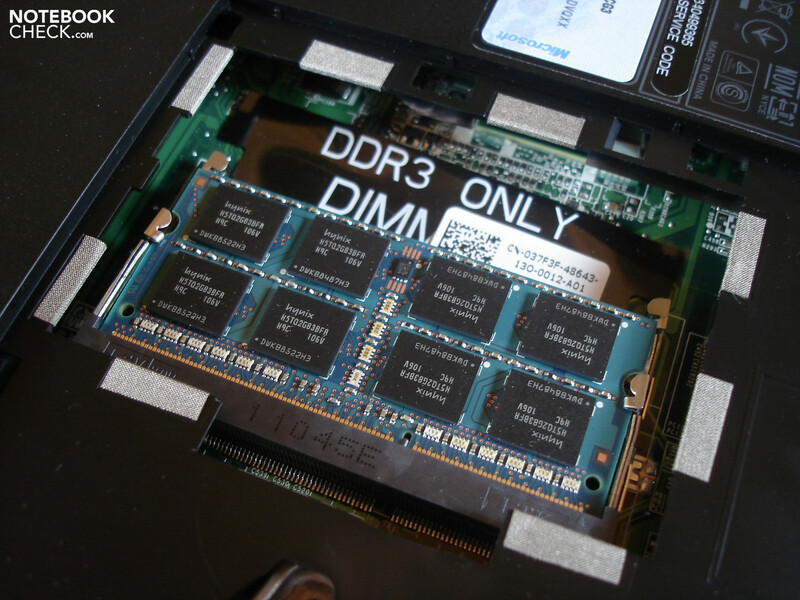 Three, respectively four GB of DDR3 RAM and a 320, respectively 500 GB HDD – that's it. 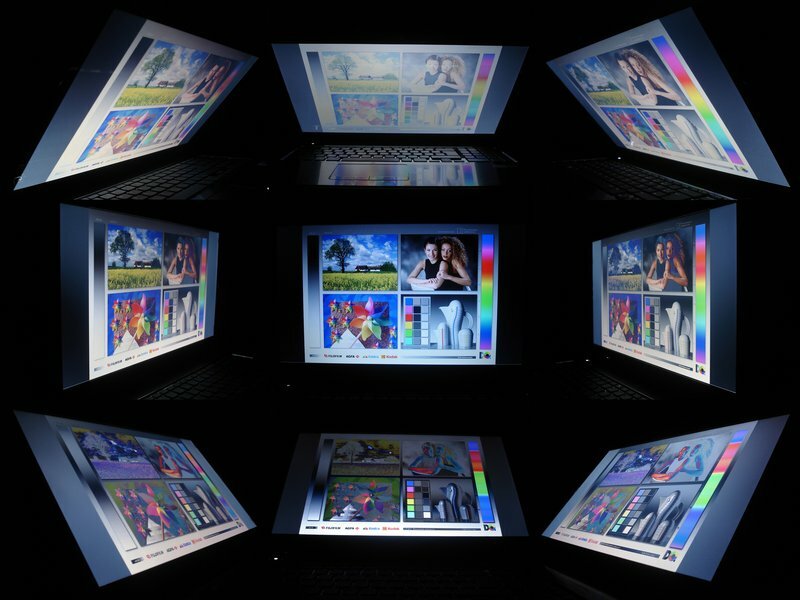 The 17.3 inch glare display has a resolution of 1600x900 pixels regardless of the model. Moreover, Dell uses both a DVD burner and Windows 7 Home Premium 64 bit. Regrettably, the laptop is remote from the configuration possibilities of an XPS 15 or an XPS 17. Regardless of that, we grabbed the Inspiron 17R's most expensive version and checked its qualities. The gray-black case made a good impression. 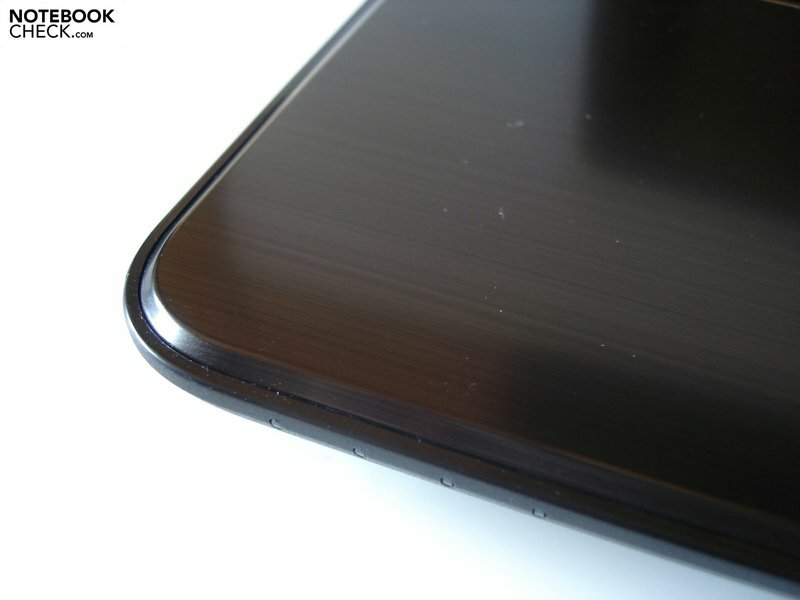 The surfaces are all made of simple plastic and have been given a fine line texture. The design and styling are very coherent. The keyboard is framed by an elegant silver bezel (reflects intensely in sunlight). However, we didn't like the partly high-gloss finish as much. In particular the display bezel and the key gaps smudge very quickly. The case is generally quite susceptible for scratches. In return, there is hardly any reason for complaint in regard to workmanship. We couldn't determine any irregular gaps. Dell could however make improvements in terms of stability. The case yields evidently on both in the height of the battery and optical drive area. 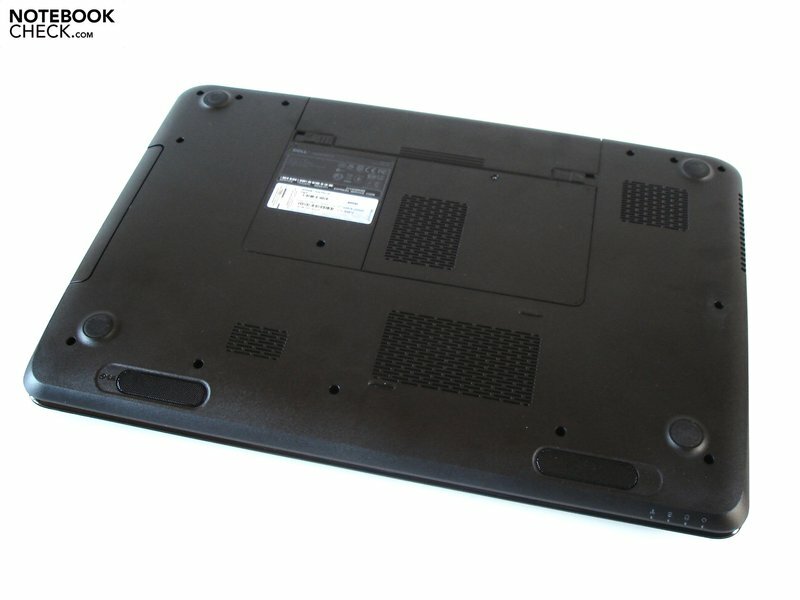 The wobbly laptop lid is in an even worse condition. Talking about wobbly: Both hinges do their job rather unsatisfactorily. For one thing, the base unit clearly lifts while opening and for the other, the screen isn't kept sufficiently in place on unstable surfaces. The Inspiron 17R hasn't really been conceived for mobile use anyway. Dimensions of 41.8x28.7 centimeters and a weight of 3.3 kilograms can get quite unhandy for carrying around after a while. Exchanging the display lid is easy by the way: simply press the unlock key intended for this, push away the lid and finished. 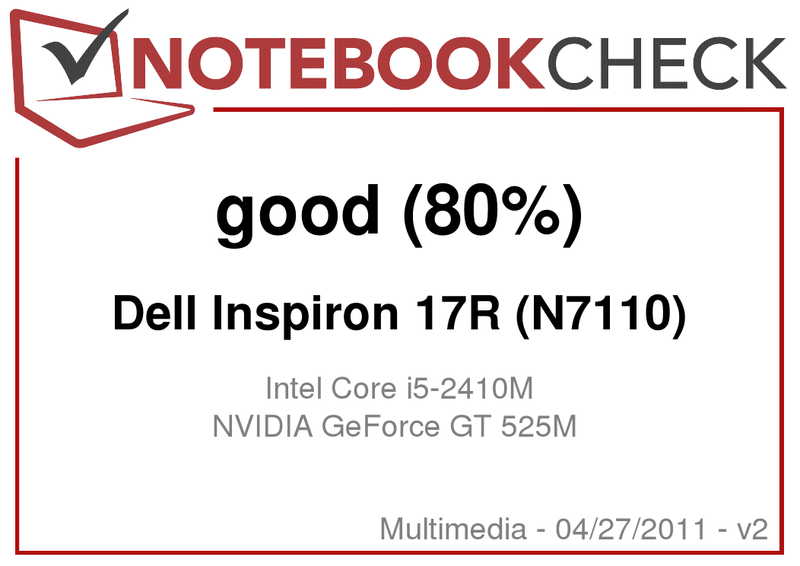 The Inspiron 17R's connectivity can't achieve any high scores. 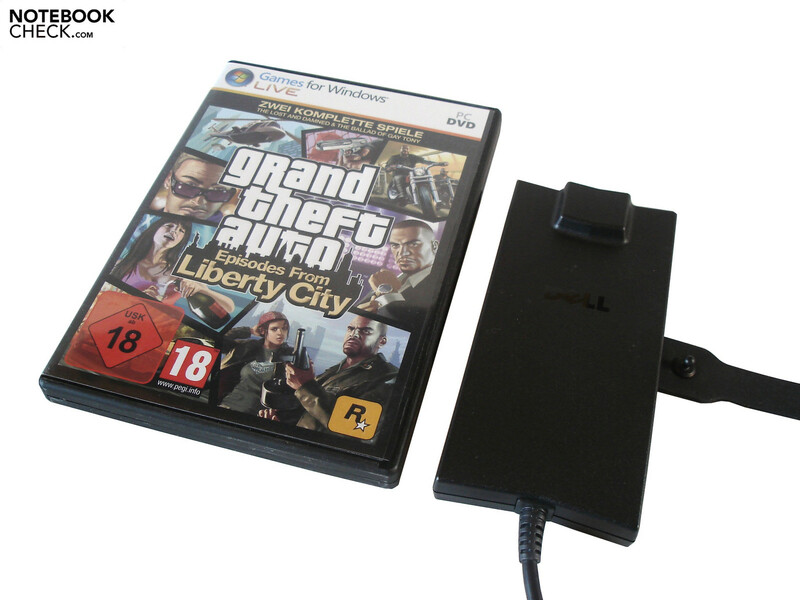 The users will look for an ExpressCard slot in vain, just like for a FireWire port. Otherwise, Dell has done a good job. 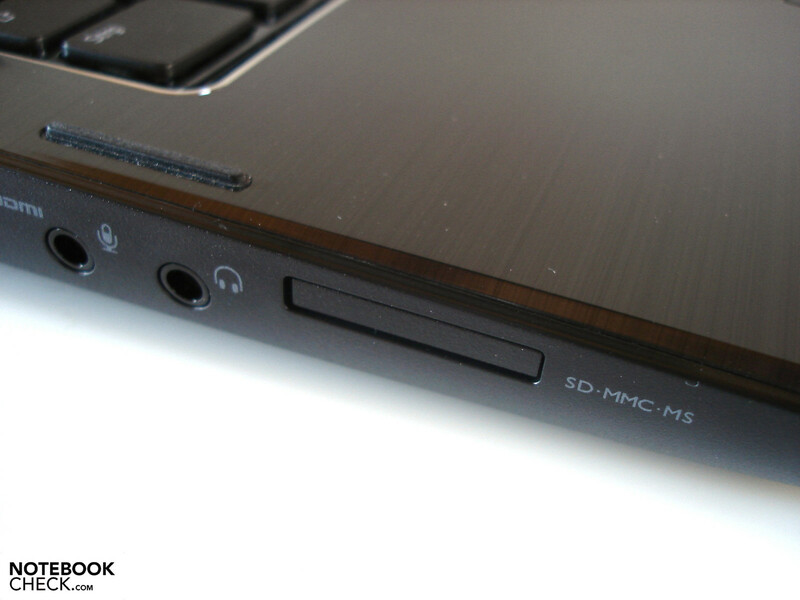 There are two cutting edge USB 3.0 ports and a USB 2.0 port behind the optical drive on the right. The rear also accommodates a few interfaces. 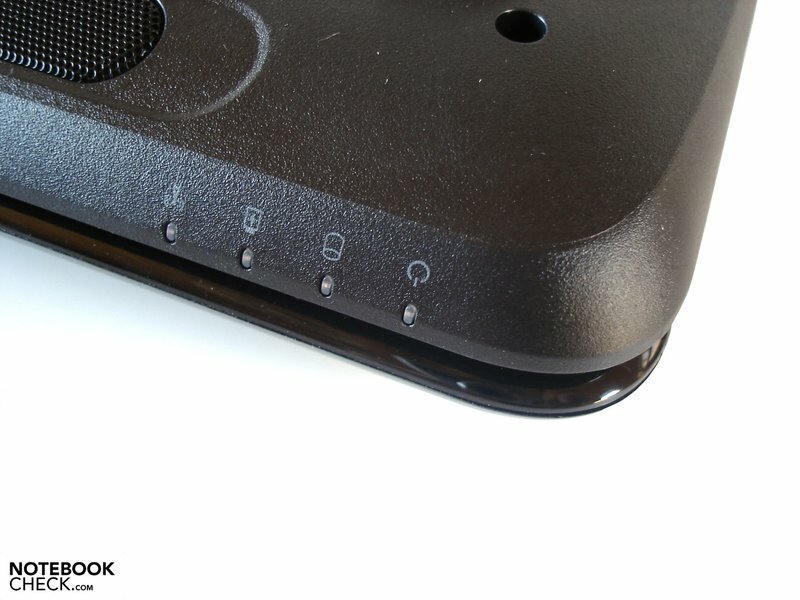 Dell has placed a RJ45 LAN port (fast Ethernet only), a VGA out, a Kensington lock and the power socket beside the battery. In our opinion, the left port positioning is suboptimal. 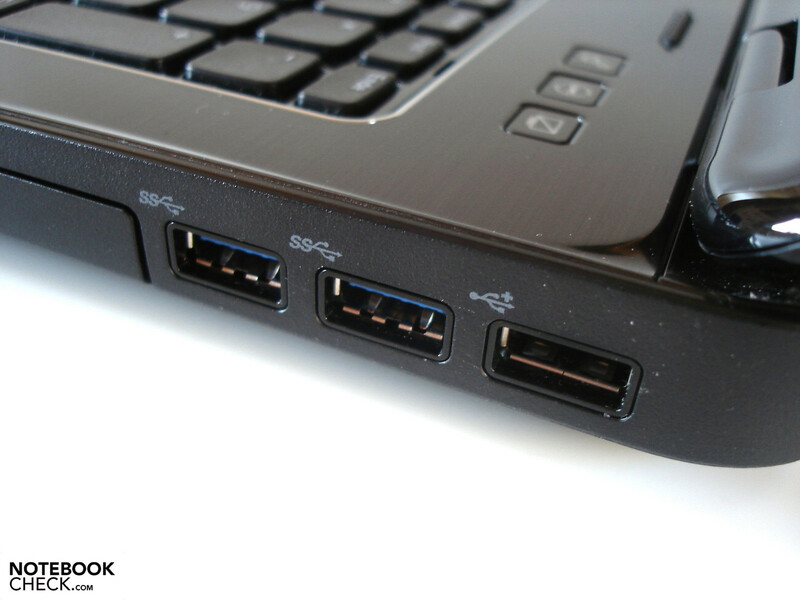 An eSATA/USB 2.0 combo, a HDMI out, two audio ports and an 8in1 cardreader are located in front of the vent. If you use a mouse on the left, you'll soon find yourself faced with room problems when many cables are connected. There's nothing to complain about in terms of wireless communication. Dell installs Intel's Centrino Wireless N 1030 module, which can handle WLAN b/g/n and Bluetooth 3.0. 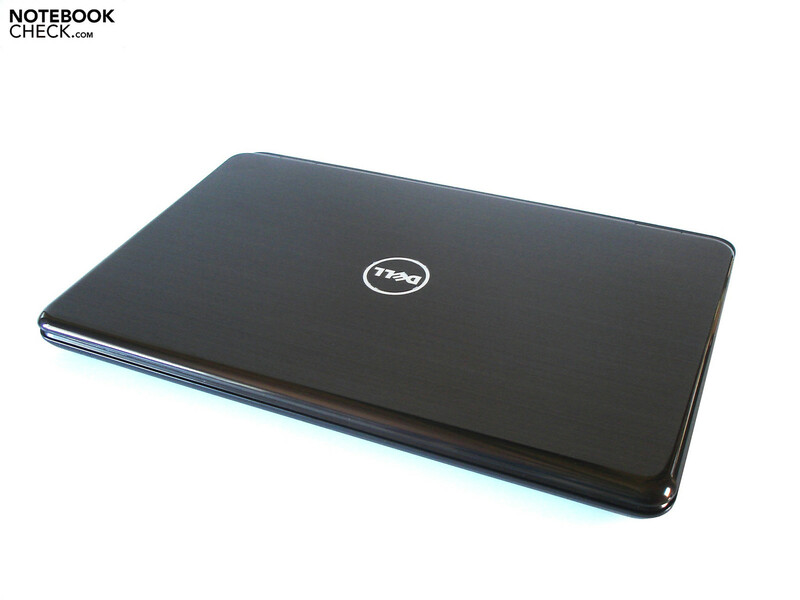 The Inspiron 17R can't yet develop its full potential in the state of delivery. Dell has pre-installed various programs that have an adverse effect on the boot process in the long run, for one thing. For another, its responsiveness immediately after the system start suffers. Not to mention various pop up reports. Windows 7 first runs pleasantly after the Inspiron 17R has been relieved from superfluous ballast. The scope of delivery is limited to the most necessary. A manual, a few info leaflets and a driver & tool DVD joins the flat 90 watt power adapter and the 6 cell battery. Beyond that, Dell adds a data carrier for recovering the operating system for a surcharge of five euros. The customer can choose among various services during the configuration. Starting with a one year pick up & return service up to a 48 month premium service with onsite repair on the next business day – the range is extensive. The keyboard is clearly inferior to the touchpad. Although, the presence of a dedicated number pad, a successful layout and the key's adequate pressure point, respectively stroke have to be mentioned on the positive side, the typing feel proved to be disagreeable. The keys are very loud and clattery so that you will likely soon attract annoyed glances in quieter surroundings. Moreover, the separated keys (chiclet design) have turned out fairly small. Especially the arrow and F keys prove to be extremely narrow. However, typos are rather rare due to the generous spacing. Too bad: Dell hasn't included a useful illumination. 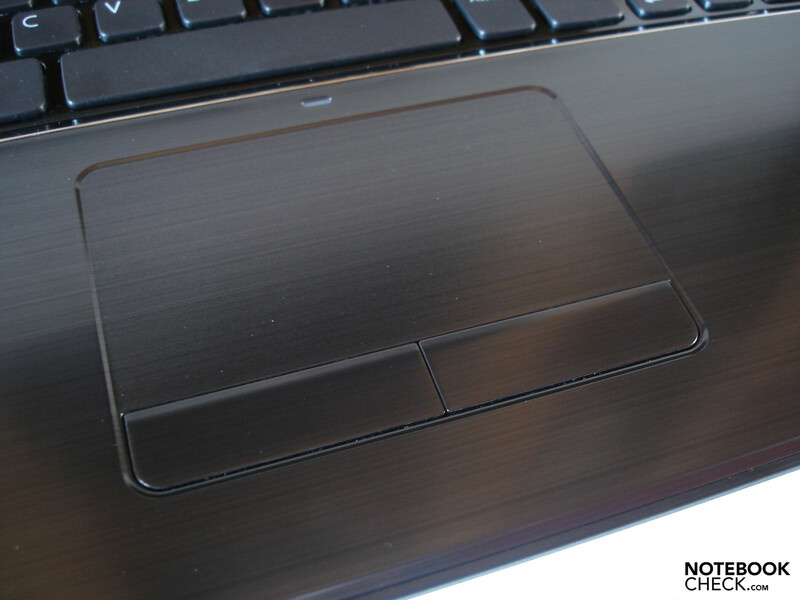 The excellent touchpad is one of the Inspiron 17R's few unique selling features. The gliding traits are outstanding thanks to the extremely smooth surface. You can hardly glide over any other device with such silkiness. The generous size is another upside. 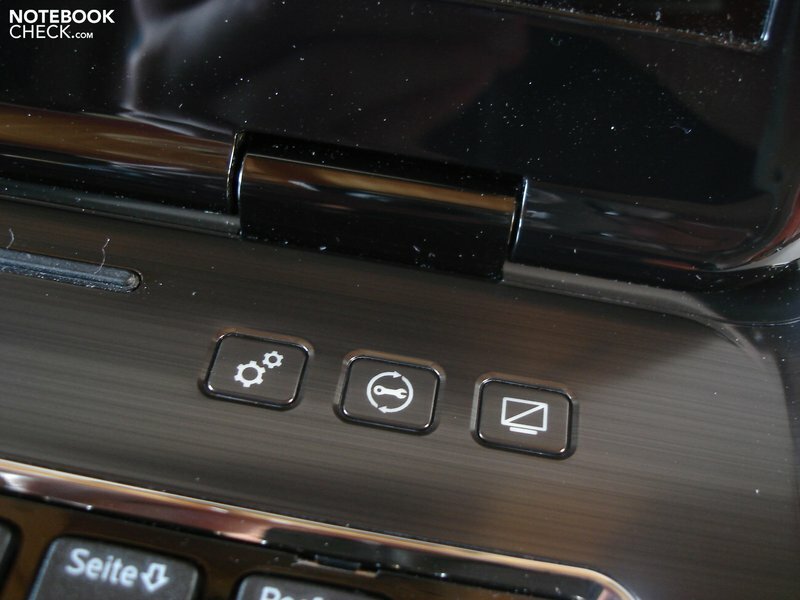 The touchpad measures a whole 100x56 millimeters. At the same time, a certain amount of orientation and feedback is granted because it's submerged. The touchpad is adequate in view of precision. Various gestures (zooming & scrolling, etc) facilitate use. On the other hand, the mouse keys respond alike the keyboard. While the triggering behavior is acceptable, the cheap sounding noise reduces the impression of quality. Like many other laptops, the screen proves to be the biggest downside. 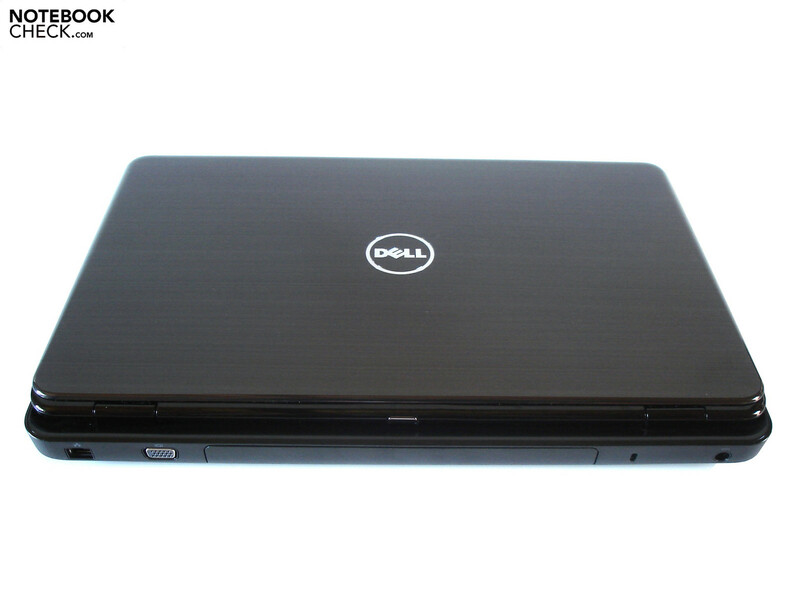 Dell relies on a 17.3 inch WLED display, which has an aspect ratio of 16:9 and a HD resolution. In our opinion, 1600x900 pixels represent a good compromise of desktop and computational effort. The installed AUO139E screen doesn't exactly belong to the best of its kind. The black value of 1.22 cd/m2 is fairly high. Dark areas in games and movies clearly have a gray cast. The contrast also proves to be weak (206:1), whereas the majority of devices are located in the range of 200:1. On the other hand, the illumination is good. More than 90% aren't a matter of course. Additionally, the display's luminosity deserves praise. An average of 250 cd/m2 let all kinds of media shine in sufficient light. 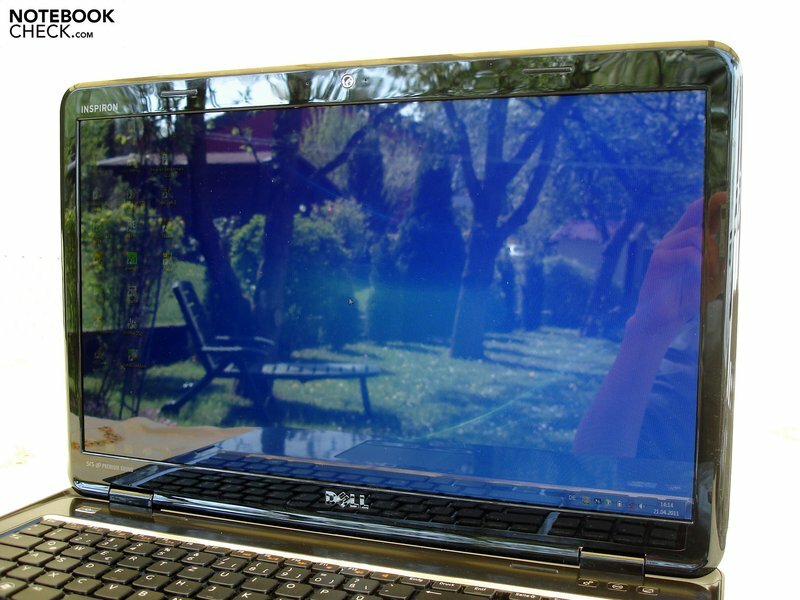 Nevertheless, the Inspiron 17R is hardly suitable for professional image editing. The screen is remote from the AdobeRGB color gamut and even the sRGB color spectrum is not quite covered. Subjectively, we find the colors' intensity adequate. The 17 incher doesn't really feel comfortable outdoors. 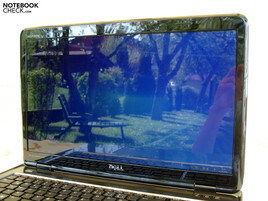 Since Dell has used a high-gloss surface, the display partly reflects intensely despite the good brightness. You also have to take care to choose an adequate location indoors to spare yourself from disturbing reflections. The moderate viewing angle stability is another flaw. Extreme deviations in colors and luminosity turn up in particular when looking up from the side. Frequent adjusting will be routine. The viewing angles are extremely narrow in the vertical plane. A dual core processor from Intel's brand new Sandy Bridge generation is used. Dell currently limits itself to two different models. While the 2.1 GHz fast Core i3-2310M has to do without an automatic overclocking, the speedy 2.3 GHz Core i5-2410M can be accelerated up to 2.90 GHz by the Turbo Boost Technology. Otherwise, both CPUs manufactured in a 32nm structure width are basically similar. Thus, both processors have 624 million transistors and a three MB L3 cache. The maximum power consumption of 35 watts isn't exactly little, but Intel's latest dual and quad cores have an incorporated graphics chip called HD Graphics 3000. It relativizes the consumption a bit. Beyond that, the Core i3-2310M and Core i5-2410M can process up to four threads at the same time, seeing that a virtual core is added to every real core. Intel's Sandy Bridge processors stand out with a well-balanced performance for money ratio. Not only is the AMD competition outdone, but Intel's older CPU generation, as well. We have compared the Core i5-2510M's performance with that of a current quad core, to be more precise the Core i7-2630QM (Dell XPS 17). There isn't much difference between both processors in Cinebench R10 64bit's single core rendering. The Core i5-2410M calculates just about as fast with 4530 to 4522 points. On the other side, the higher core count of the Core i7-2630QM becomes noticed in the multi core rendering. The Core i5-2410M has to admit defeat by a whole 77% with 16830 to 9505 points. The CPU score discloses an increase of this trend. The Core i7-2630QM has the lead by a remarkable 86% due to 4.84 to 2.60 points. A dual core is of course absolutely sufficient for routine use. The Core i5-2410M's performance complies with the midrange. Dell has also opted for a midrange graphics card. Nvidia's GeForce GT 525M is the immediate heir to the popular GeForce GT 425M. Alike the predecessor, the GT 525M is based on the GF 108 chip (Fermi architecture) and is manufactured in a 40 nm process. It can serve with 96 unified shaders and supports DirectX 1. The clock rates are somewhat below that of the stronger GeForce GT 540M – instead of 672/900/1344 MHz, the GT 525M runs with 600/900/1200 MHz (core/memory/shader). The DDR3 video memory is sufficiently sized with 1024 MB. However, an interface of 128 bit soon finds its limits in modern games. In order to avoid restrictions, the DDR3 VRAM should optimally have a bus of at least 256 bits. Nevertheless, the Nvidia card doesn't lack features. GPU based physics and video acceleration (PhysX & PureVideo HD) and stereoscopic 3D operation (3D Vision & 3DTV Play) are only a few examples. The power consumption doesn't have to accept any complaint: We would call a TDP of 25 watts moderate. 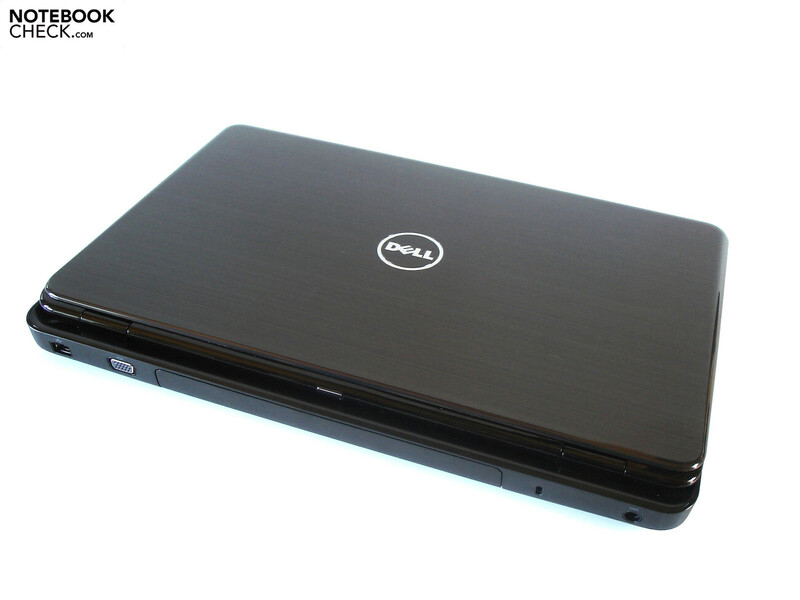 One of the most important features of the Inspiron 17R is the so-called Optimus Technology. This is a technology developed by Nvidia for dynamically switching the graphics. Either the incorporated or the dedicated graphics card is enabled depending on the requirements placed by an application. This process happens fully automated and without visible transition. Optimus works rather faultless and reliable when a fairly new driver is used and the update function in Nvidia's system control is enabled. The user can intervene manually should problems turn up and assign a specific graphics unit to the single application, or change the globally preferred GPU right away. 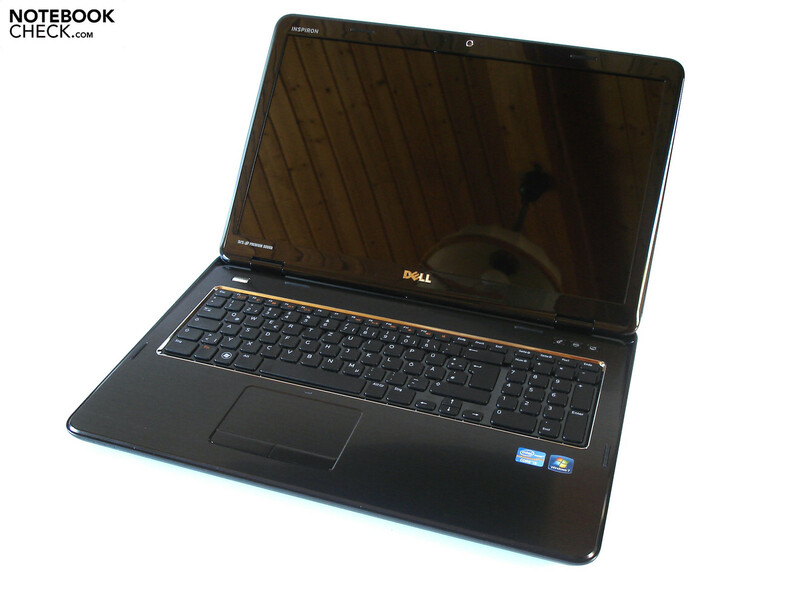 We would refer to the review of Dell's XPS 15 for more tips and notes about Optimus. As expected, the GeForce GT 515M is located in the midfield. We tested the increasingly important for the future DirectX 11 performance with 3DMark 11 (1280x720) and Unigine Heaven 2.1 benchmark (1280x1024). On the one side, the Radeon HD 6650M (Packard Bell EasyNote LS11) and on the other, the GeForce GT 540M (Dell XPS 15) had to serve as a comparison basis. In the Unigine Heaven 2.1 benchmark, which makes massive use of tessellation, the GeForce GT 525M delivers a satisfactory show and performs on par with the Radeon HD 6650M with 12.0 fps. The HD 6650M achieved 11.9 fps in our test (GeForce GT 540M: 13.9 fps). The Nvidia graphic cards don't do quite as well in the 3DMark 11's GPU score. With 808 points, the GeForce GT 525M places itself behind the GeForce GT 540M (899 points) by 9% and behind the Radeon HD 6650M (1013 points) by 20%. 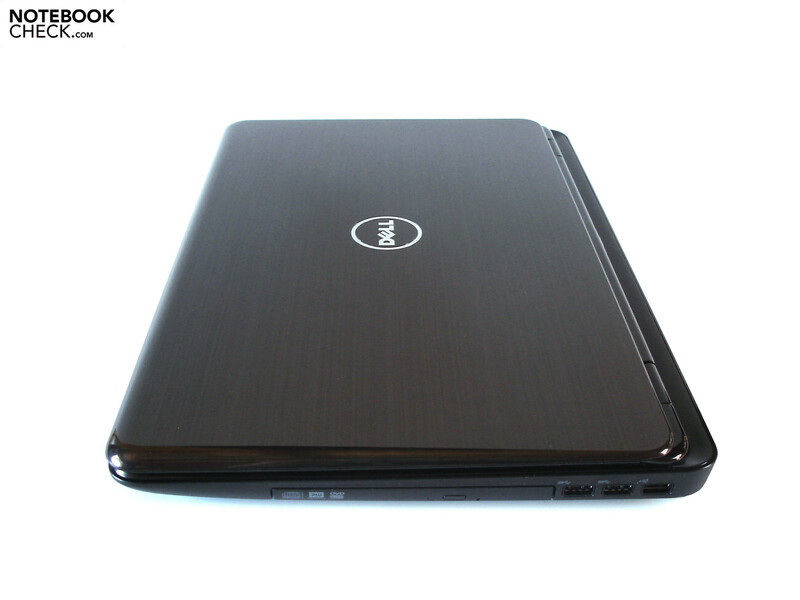 The Inspiron 17R's top model is standardly equipped with a 500 GB HDD. The installed Western Digital WDC WD5000BEVT-750RT0 doesn't belong to the fastest representatives with a speed of 5400 rpm. The sequential read and write rates are rather average with 67.75, respectively 63.43 MB/s. Good HDDs easily achieve more than 80 MB/s. State of the art SSDs can even achieve more than 300 MB/s. By the way: Amateurs shouldn't try to change the HDD. 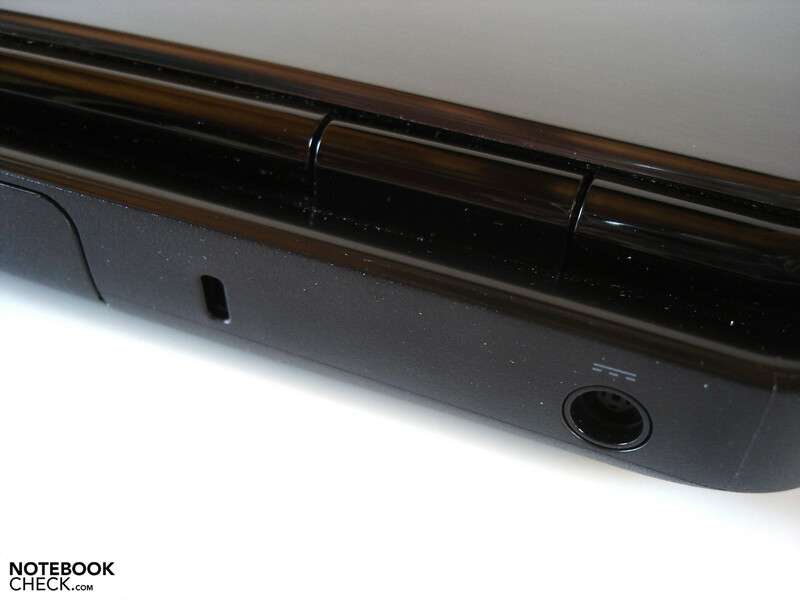 The removable (screwed) cover only allows accessing the RAM (two slots). The Inspiron 17R offers exactly what user orientated on versatility want from a laptop for less than 1000 euros: proper performance for a fair price. 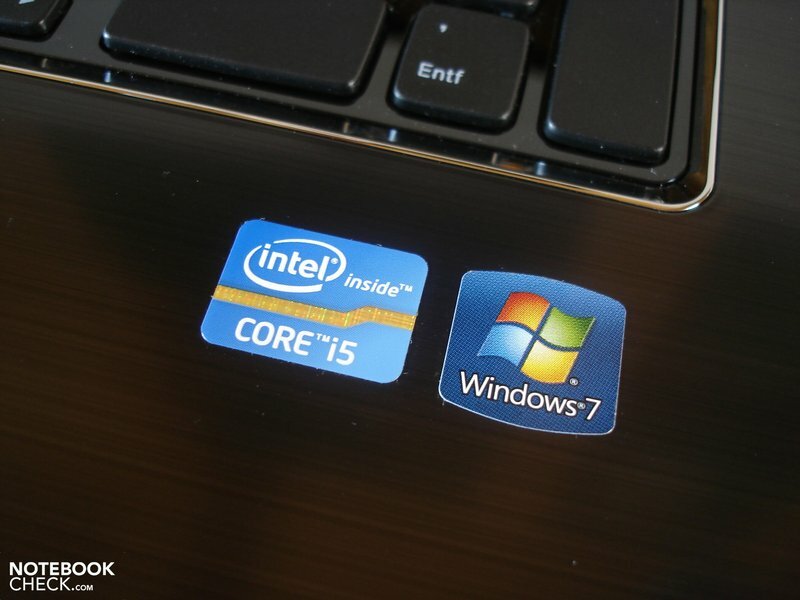 Intel's Core i5-2410M and Nvidia's GeForce GT 525M manage most tasks perfectly. Office, Internet and movies aren't any problem for the Inspiron 17R. You would need a faster system only if you have to deal with intricate 3D applications on a daily basis or do a vast amount of video editing. The GeForce GT 525M again has to face up to the Radeon HD 6650M (Packard Bell EasyNote LS11) and the GeForce GT 540M (Dell XPS 15 & Schenker XMG A501) in the gaming benchmarks. To keep the processor's impact as low as possible, we have opted for our ultra settings (1920x1080, maximum details) for the comparison – with exception of Metro 2033. The newest sequel of the extremely successful Call of Duty series doesn't force the Inspiron 17R to its knees. Very high details, quadruple antialiasing and octuple anisotropic filtering result in an average of 26.4 fps. The GeForce GT 525M places itself almost exactly between the Radeon HD 6650M (24.5 fps) and the GeForce GT 540M (29.1 fps) with this result. Nevertheless, high details, 2x AA, 4x AF and 1600x900 pixels are recommendable for a pleasurable game play. The soccer simulation, Fifa 11, can be enjoyed in its maximum looks thanks to its low hardware requirements. The players sprint very smoothly over the soccer field even in high details and quadruple antialiasing (63.0 fps). Just like in Call of Duty: Black Ops, the GeForce GT 525M calculates faster than the Radeon HD 6650M (52.4 fps), but a bit slower than the GeForce GT 540M (70.4 fps). The Inspiron 17R wasn't strong enough for high details and 16x anisotropic filtering in the built-in benchmark of the atmospheric gangster drama. 18.8 fps just aren't enough for a track in third person view. The Radeon HD 6650M (20.6 fps) and GeForce GT 540M (20.9 fps) also fail in these settings. We would recommend medium details, 8x AF and a resolution of 1600x900. The real time strategy hit from Blizzard demands fairly strong hardware although it in no way has outstanding looks. The pre-setting "ultra" overtaxes the Inspiron 17R visibly. It's just enough for weak 16.0 fps in the intro of the challenge "For the Swarm". Starcraft 2 also stutters extremely on the Radeon HD 6650M (16.7 fps) and GeForce GT 540M (17.3 fps). You should demand more than high details and 1600x900 pixels from the GeForce GT 525M. 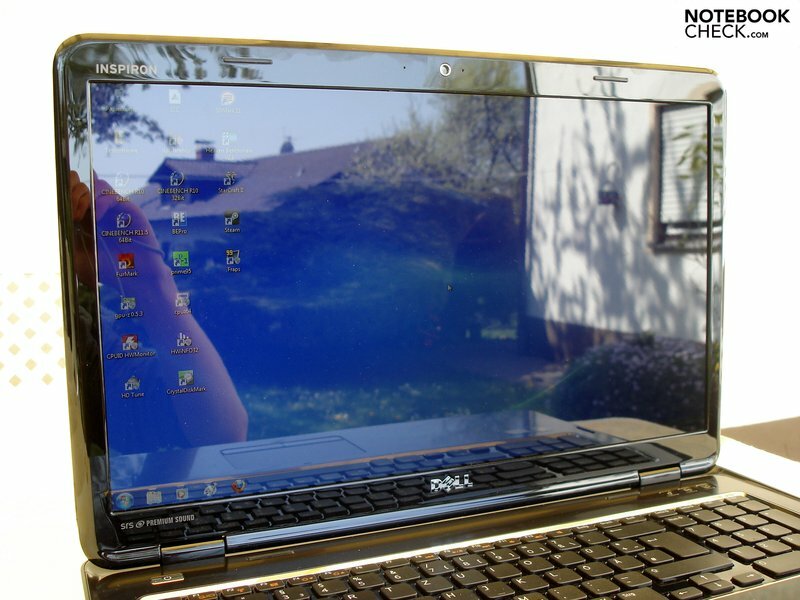 The technically extremely demanding first person shooter lets the Inspiron 17R work up quite a sweat. The GeForce GT 525M has an extremely hard time even without DirectX 11 mode, very high details and Full HD resolution. High details, DirectX 10 mode and 1600x900 pixels led to poor 13.1 fps. Although the GeForce GT 540M (14.4 fps) and the Radeon HD 6650M (15.9 fps) are theoretically faster, Metro 2033 stutters just as much in practical use. Our benchmark sequence was first rendered smoothly in low details, DirectX 9 mode and a resolution of 800x600. In order to really excel in heated multiplayer battles, you inevitably have to live with the medium detail level in Bad Company 2. Additionally, you should stay away from quality enhancements. The frame rate settled to an insufficient 13.9 fps when high details, quadruple antialiasing and octuple anisotropic filtering are used. The GeForce GT 540M (15.5 fps) and Radeon HD 6650M (15.8 fps) can dissociate themselves by more than 10%, at least on paper. It's not very surprising that the GeForce GT 525M is conceivably unsuitable for passionate gamers. The Nvidia GPU doesn't come close to managing a combination of Full HD resolution (1920x1080) and maximum graphics settings. The situation looks quite a bit better in the HD+ resolution of 1600x900. However, medium details often prove to be the limit here. In our opinion, the GeForce GT 525M is rather more designed for the normal HD resolution of 1366x768 – without the quality enhancement, antialiasing, high details are possible in most cases. Other graphic cards, which are found in the same price range, can partly score better. On total, the Radeon HD 6650M and GeForce GT 540M have the lead by almost 10%. 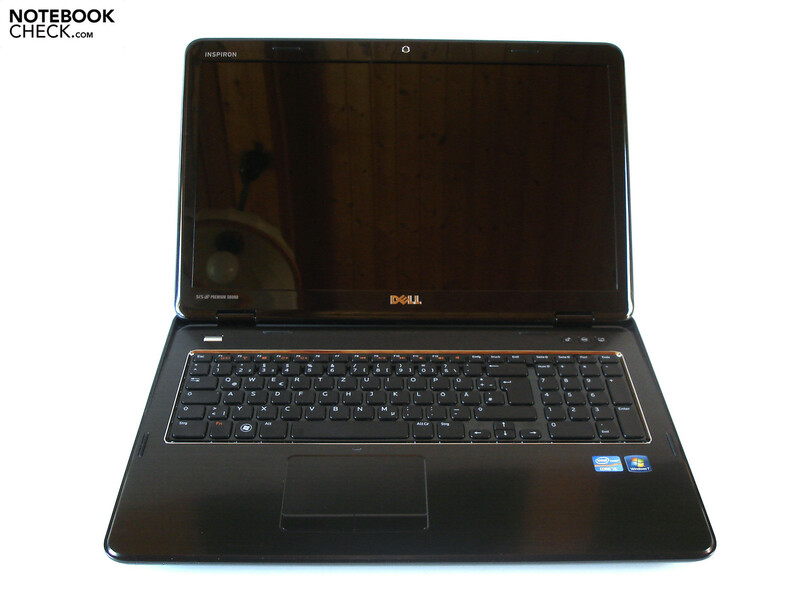 However, the Inspiron 17R's performance is definitely impressive at a total price of 700 euros. If you want to play 50% faster you don't have to dig much deeper in your pocket though. Noticeably faster laptops, such as the Dell XPS 17 with a GeForce GT 555M, are available for up to 1000 euros. The emissions range on an average level. The Inspiron 17R works almost silently in idle mode. The case fan deactivates itself completely, except for short increases. In return, the laptop is slightly audible in low load (e.g. movies) where the fan quietly whirrs along. The 17 incher first really gets audible during load. The soundscape of games is only drowned out in quiet scenes, though. We never found the Inspiron 17R annoying loud at any time. The noise development isn't even exaggerated even during full load. We merely noticed the hard disk as somewhat unfavorable; it ran a bit unsmooth especially when the load states changed. Beyond that, the laptop occasionally emitted a whistling noise. Its origin couldn't be located exactly, though. The temperature development in idle mode especially appealed to us. An average surface temperature of about 25°C presents a comfortable work environment. The top and bottom partly heat up to 38, respectively 42°C during load. However, the wrist-rest stays within a pleasant range with a maximum of 31°C. Let's take a look inside the case. The components aren't cooled outstandingly, but at least sufficiently in idle mode. While the processor heats up to about 50°C, the graphics card reaches around 44°C. The temperatures are also completely okay during full load – the Core i5-2410M and GeForce GT 525M settle to almost 80°C. Note: Within our stability test with Furmark and Prime tools, the processor clocked down to a constant 1800 MHz after a while. The so-called CPU throttling is a frequent problem in Dell laptops, whereas this behavior is limited to extreme conditions with full load. Dell has treated the Inspiron 17R to a subwoofer (3 watts) and two speakers (2 watts each). All are hidden on the case's bottom. The installed 2.1 system has to be described as functional in terms of sound. As usual, it lacks precision, balance and volume. The sound makes a muffled impression; the bass also doesn't really develop. At least the maximum volume is convincing. The laptop is very present with enabled SRS Premium Sound. The SRS technology can be adapted in many ways to suit personal needs in the speaker properties. If you don't want to experiment too much, you can simply use the default setting of the three different scenarios (music, movies & games). 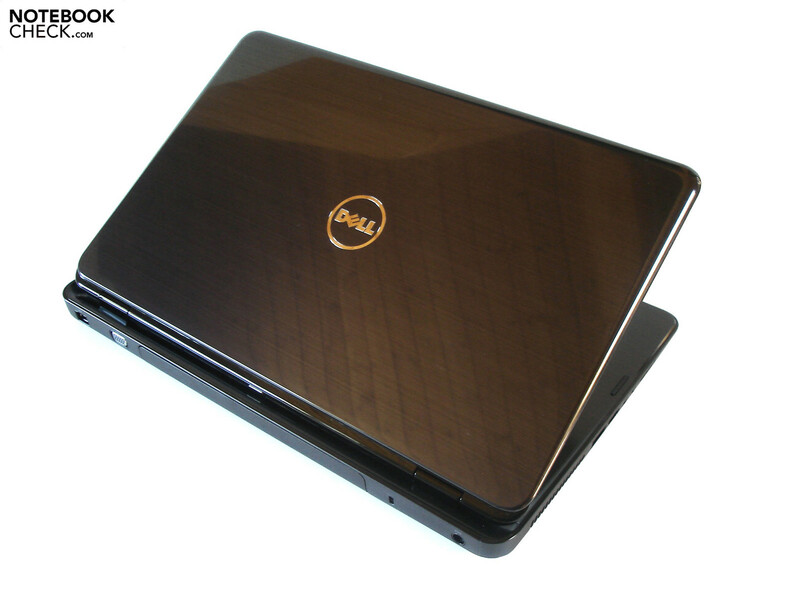 Nevertheless, the Inspiron 17R is remote from the sound qualities of the XPS 17 or the Asus G73SW. If possible, external loudspeakers should be used. 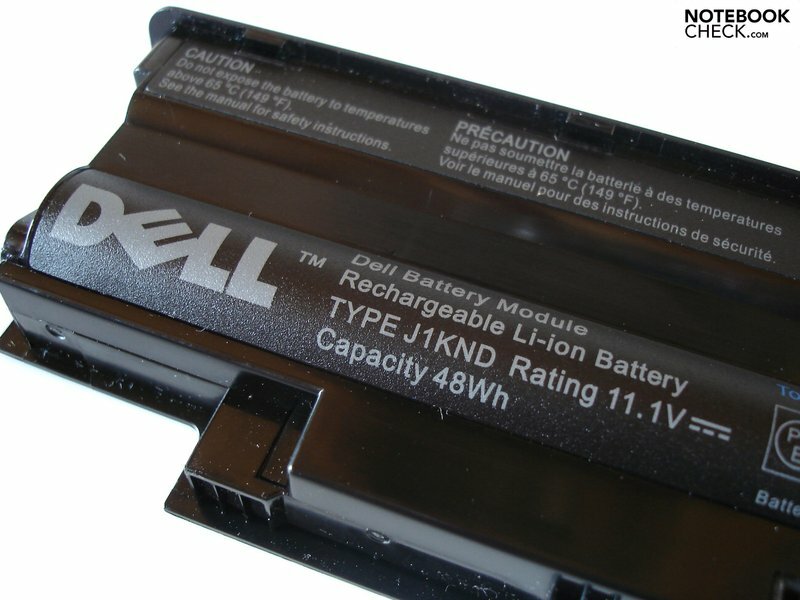 Although the included 6 cell battery is rather weak (48 WH), the Inspiron 17R looks good remote from the mains. This circumstance is due to the components' moderate power consumption on the one hand. On the other, it can be ascribed to Nvidia's Optimus Technology. The screen, set to minimum brightness and maximum energy saving options, first turned black after more than six hours in BatteryEater's Reader's Test, which simulates a low system load. Wireless Internet surfing in maximum brightness and medium energy savings settings ends up in a significantly lower runtime. Nevertheless, about 3.5 hours will likely please most users. Mobile movie entertainment is also not a foreign word for the Inspiron 17R. Playing our test DVD stopped after two hours and 40 minutes. On the other hand, the 17 incher is quickly drained during high load. BatteryEater's Classic Test ran with maximum brightness and disabled energy savings options for only just 60 minutes. If you expect more mobility, you should look around for Optimus capable laptops with a stronger battery (e.g. Dell XPS 15). The power consumption is inconspicuous. 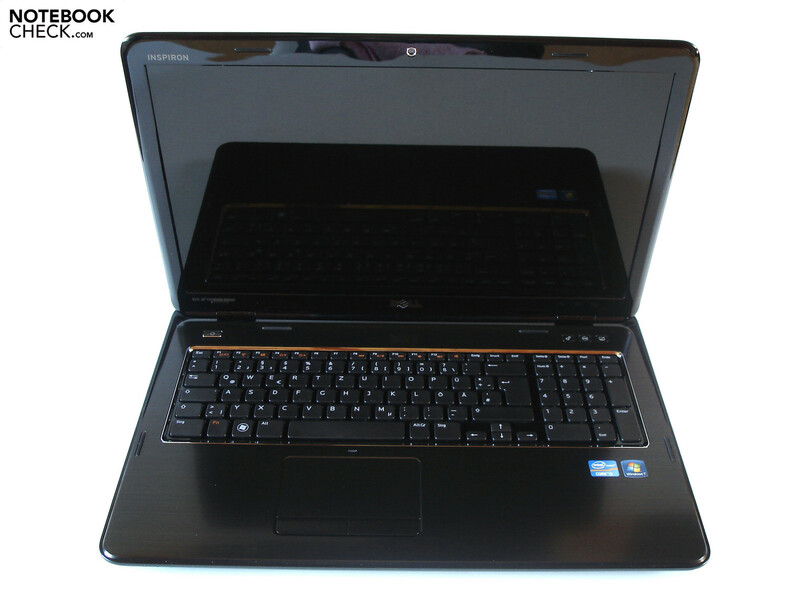 10.2 – 18.9 watts in idle mode and 56.7 – 80.4 watts in load are more or less within the range of the comparably equipped Packard Bell EasyNote LS11. 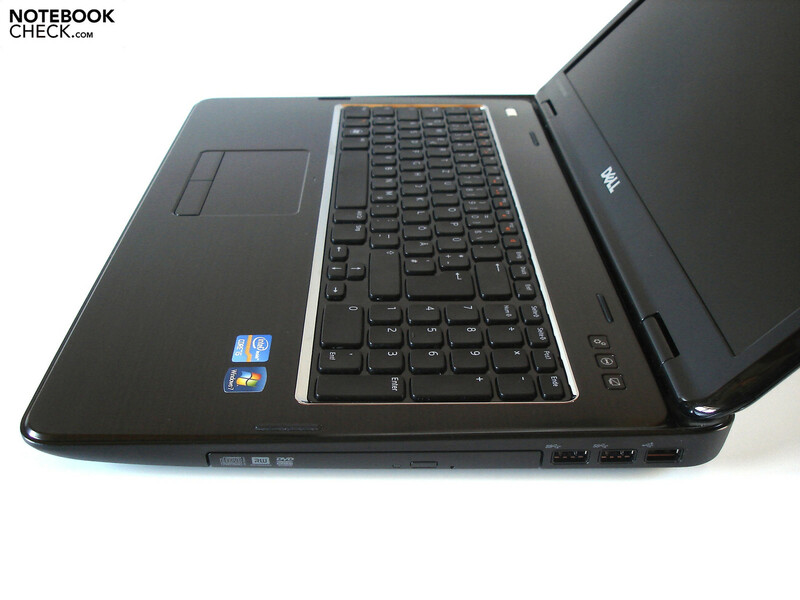 The Schenker XMG A701, with a Core i7-2630QM, treats itself to considerably more power. 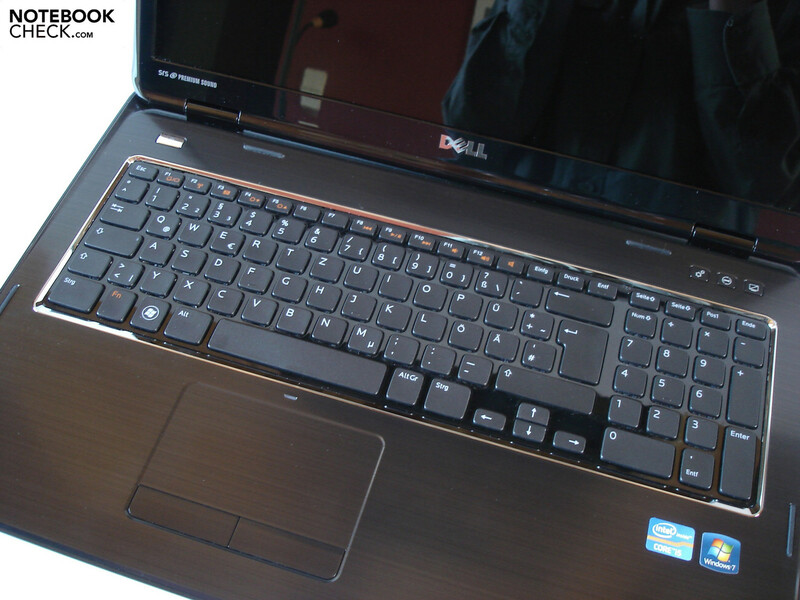 The Inspiron 17R is a typical multimedia laptop that doesn't allow itself to make many mistakes. At the same time, it doesn't really excel in any relation. Workmanship, keyboard, connectivity, performance and emissions are on about the normal standard. As most other manufacturers, Dell unfortunately uses a run of the mill display that will only suffice less demanding users. 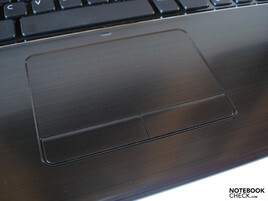 However, the smooth and pleasantly large touchpad has to be mentioned positively. Most laptops can only dream of that. The battery life also surpasses numerous opponents. The Inspiron 17R can be used in many ways. Short: If you yearn for an all-round suitable multimedia laptop and don't want to spend more than 1000 euros, you could take a liking to the Inspiron 17R. 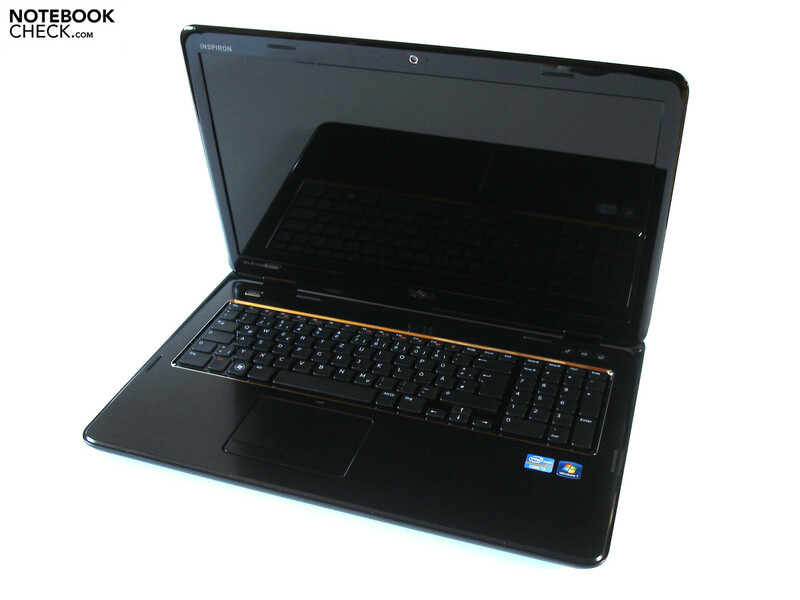 The main rival from Packard Bell, the equally priced EasyNote LS11, lags behind the Inspiron 17R in terms of connectivity and battery life, but it scores with a somewhat higher performance and a lower system noise. If you don't have to mind your wallet as much, you should preferably take the XPS 15 or XPS 17 right away. 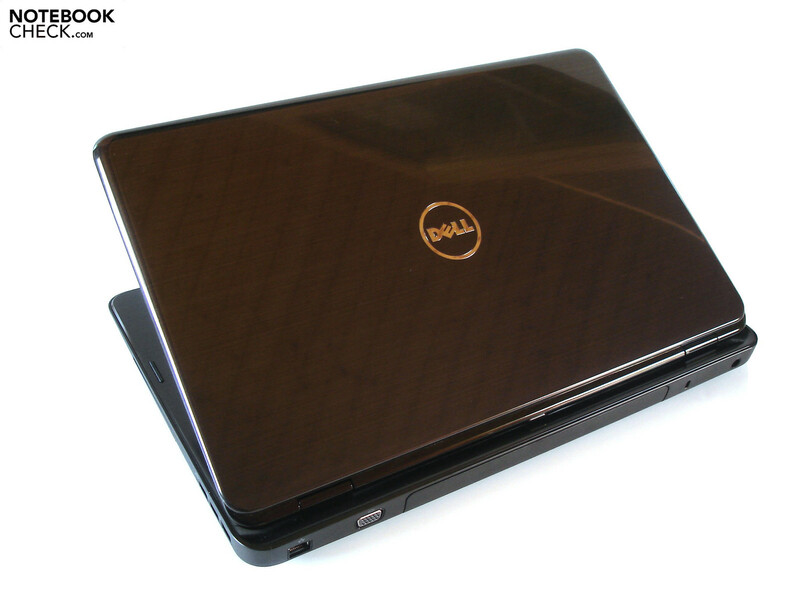 Dell's "superior" range excels the Inspiron 17R in many things. The case weighs over three kilograms. 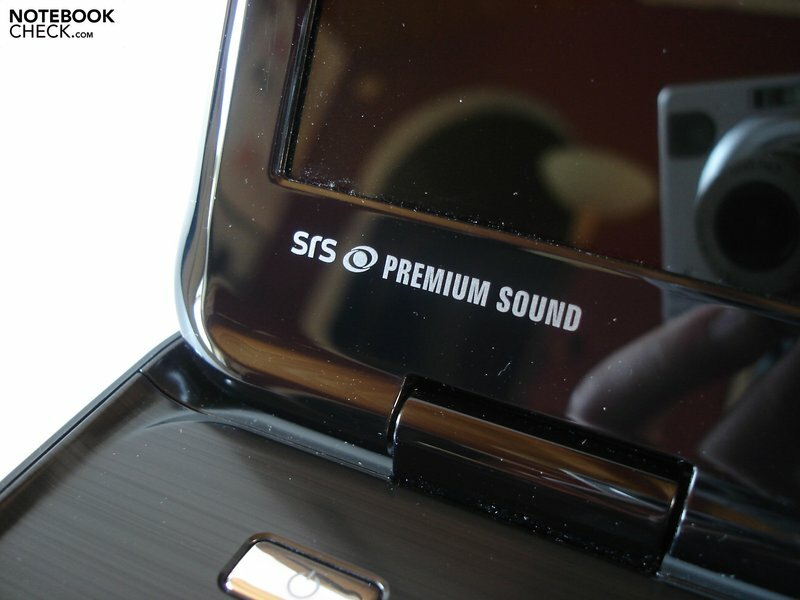 The laptop is capable of SRS Premium Sound. There's not much to complain about in terms of workmanship. 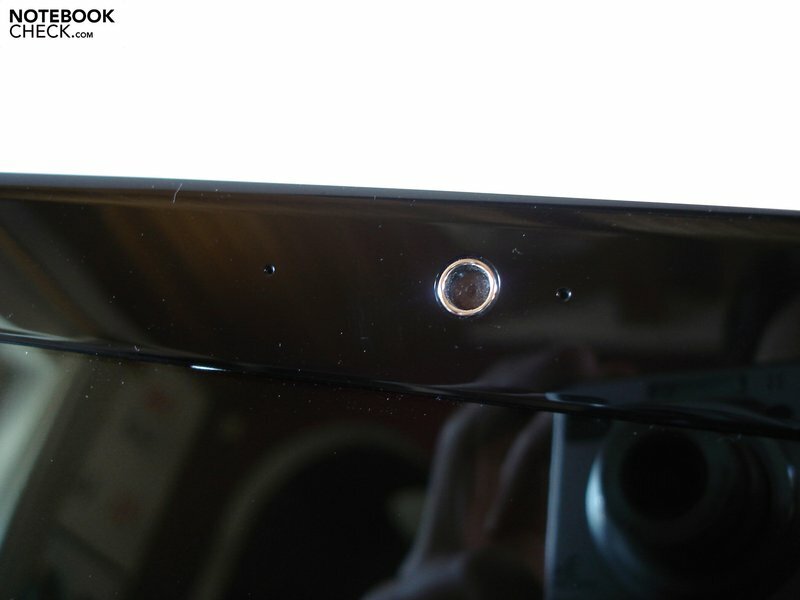 The high-gloss display bezel is very sensitive. Dust soon collects between the keys. Dell relies on midrange hardware. 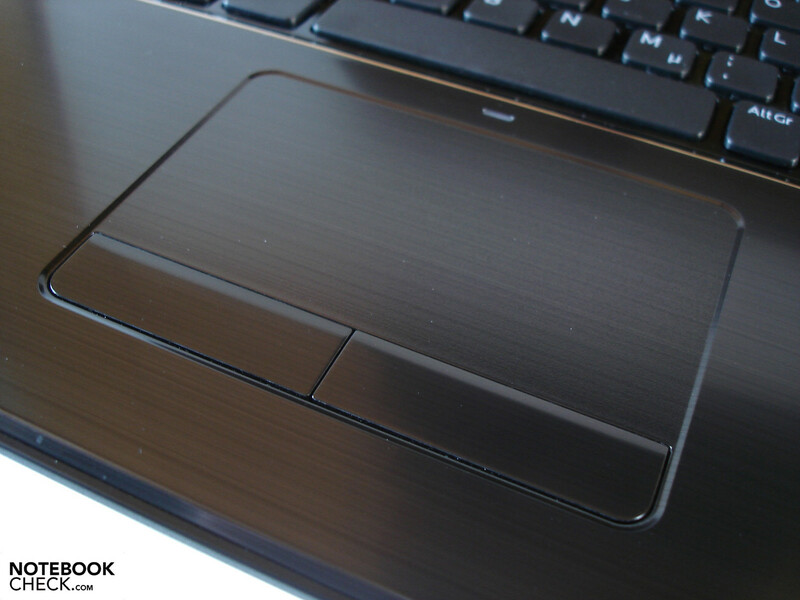 The touchpad is pleasantly smooth and agreeably large. A dedicated number pad easily found a place. Wrist-rest and lid have a fine texture. 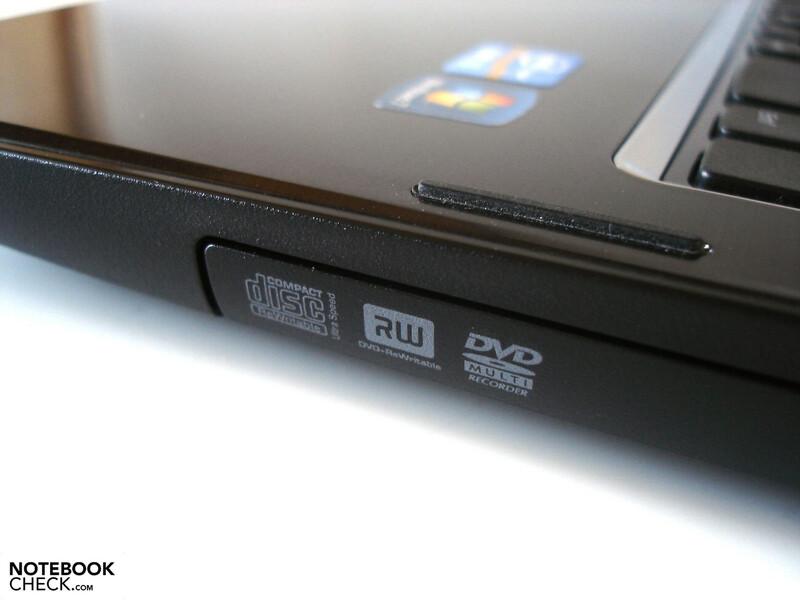 A conventional DVD burner serves as the optical drive. 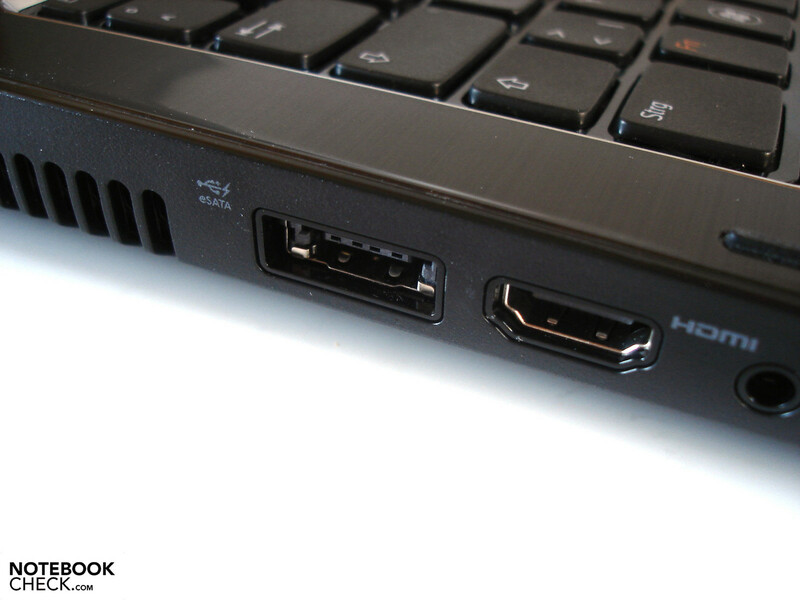 The right accommodates two cutting edge USB 3.0 ports. The user has to live without gigabit LAN. The laptop gets its power over the rear. External monitors are fed with videos via VGA or HDMI. The installed cardreader can deal with eight formats. The four status indicators light up in white. The 90 watt power adapter is surprisingly flat. 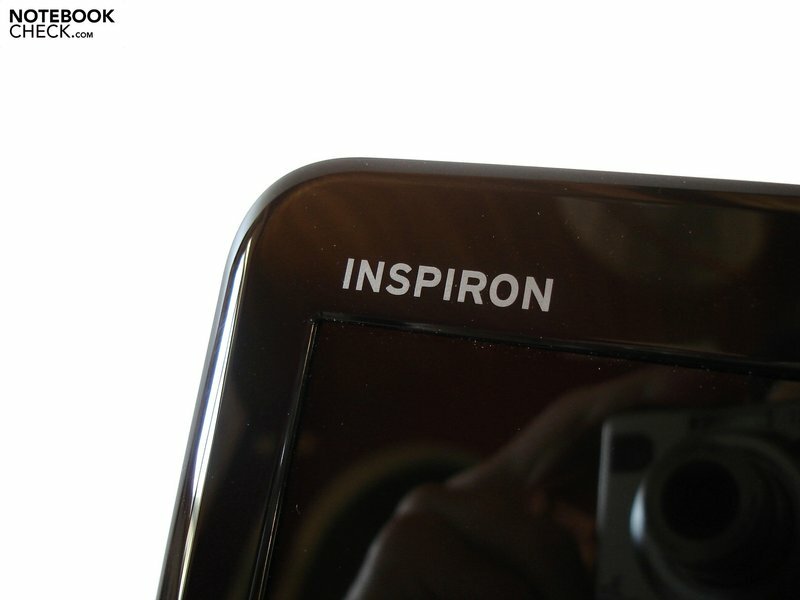 An Inspiron logo adorns the display bezel. The battery life is acceptable thanks to Optimus. 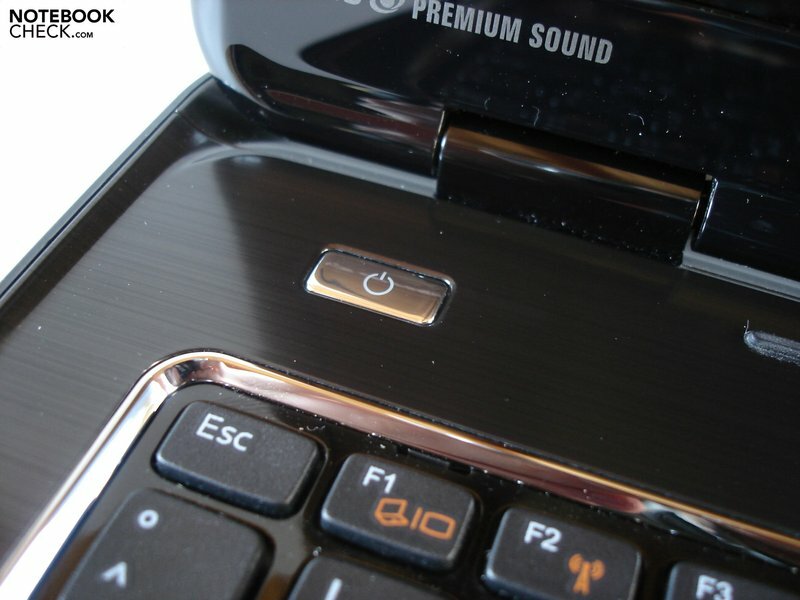 The keyboard is framed by a silver bezel. Various designs are available for the lid. The 17.3 inch screen reflects intensely. The case has a height of almost four centimeters in the rear area. The maximum opening angle could be a bit wider. 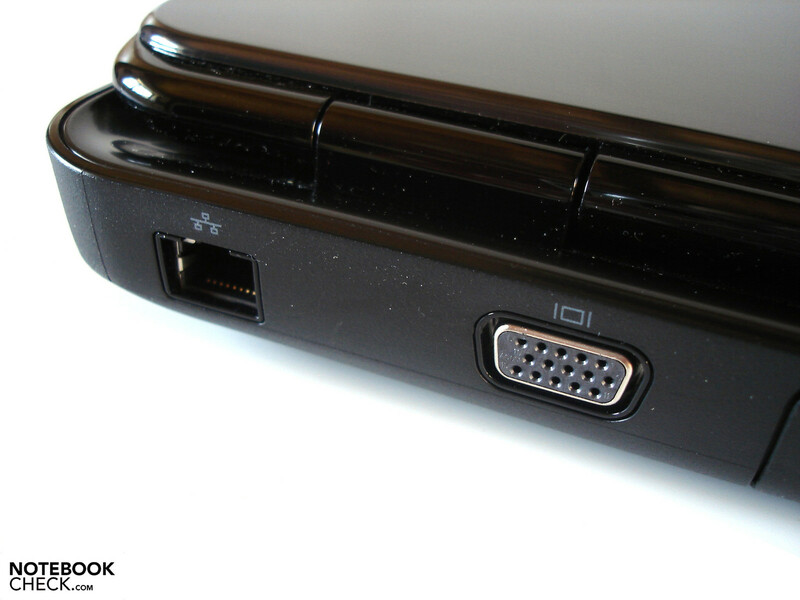 A few ports are on the rear. 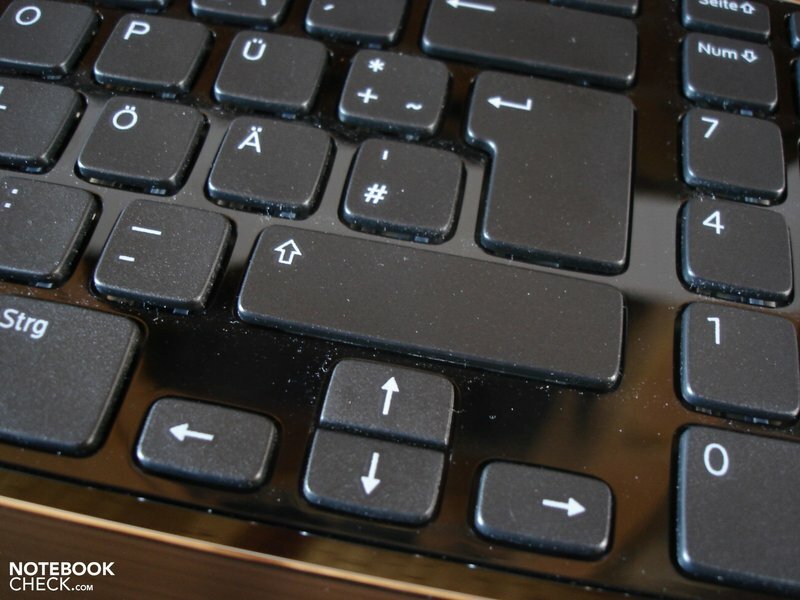 The clattery keyboard doesn't make a quality impression. The hinges can't keep the display in place during vibrations. 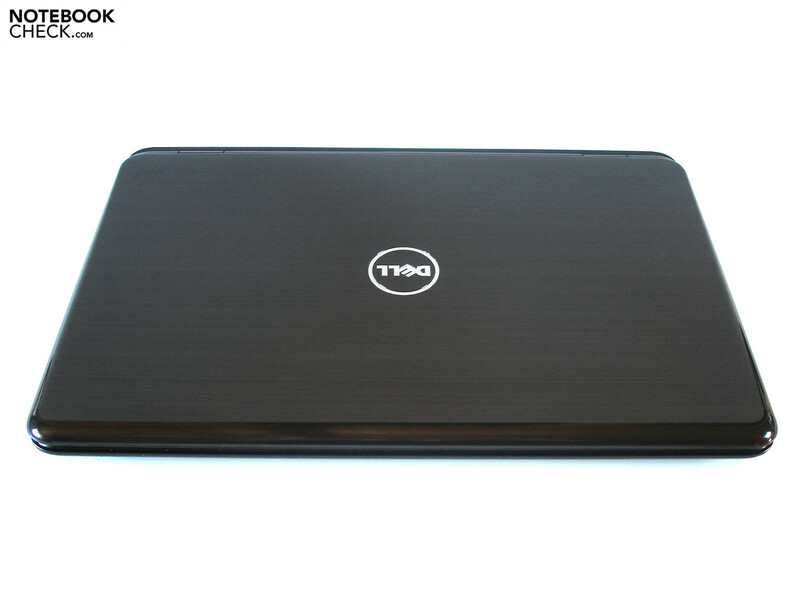 The Inspiron 17R's design is quite successful. The waste heat is discharged from the left. The optical drive is located on the right. Dell has placed both loudspeakers on the bottom. Merely the RAM is accessible. The webcam has a resolution of 1.0 megapixels. The 6 cell battery closes flush with the case. 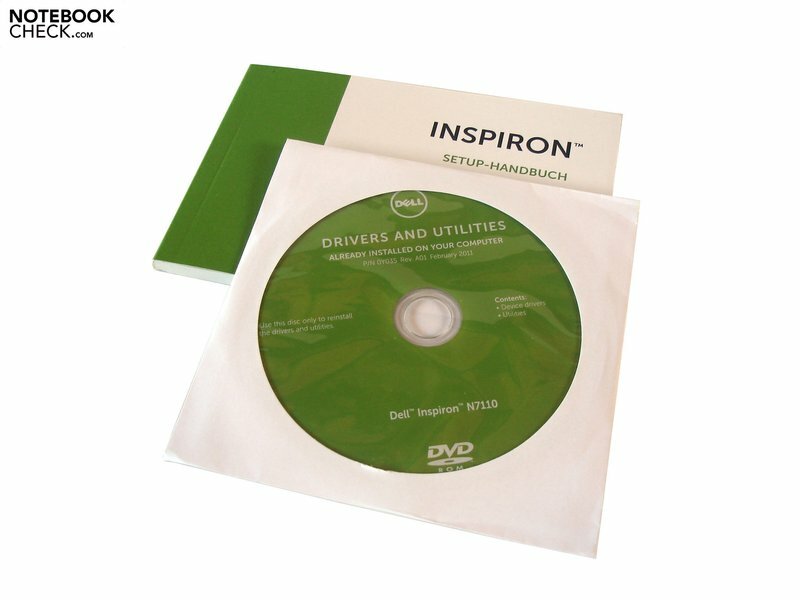 A manual and a driver & tool DVD are included in the scope of delivery. The price is very fair in view of the given performance. Better speakers and a higher quality display. Dell installs an extremely large touchpad. 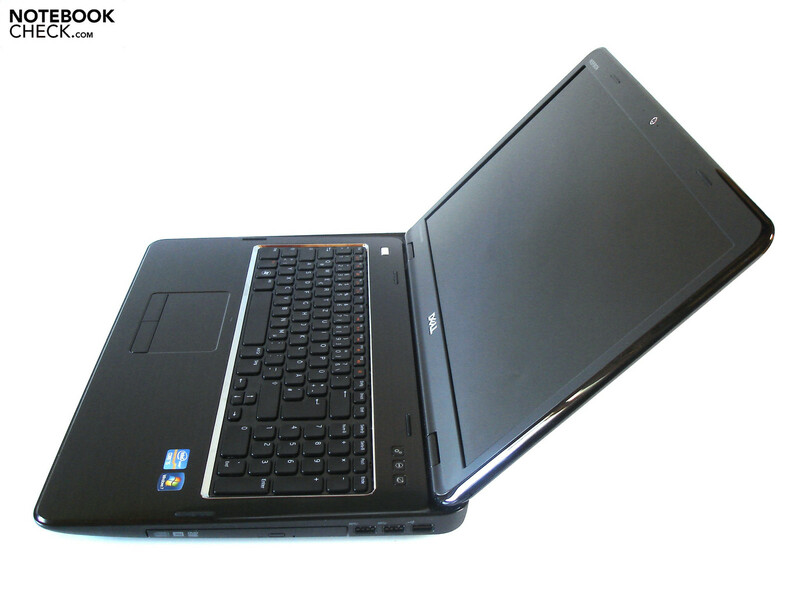 17 inch multimedia laptops with a Sandy Bridge processor, such as Acer Aspire 7750G, the Dell XPS 17, the Packard Bell EasyNote LS11 or the Schenker XMG A701.